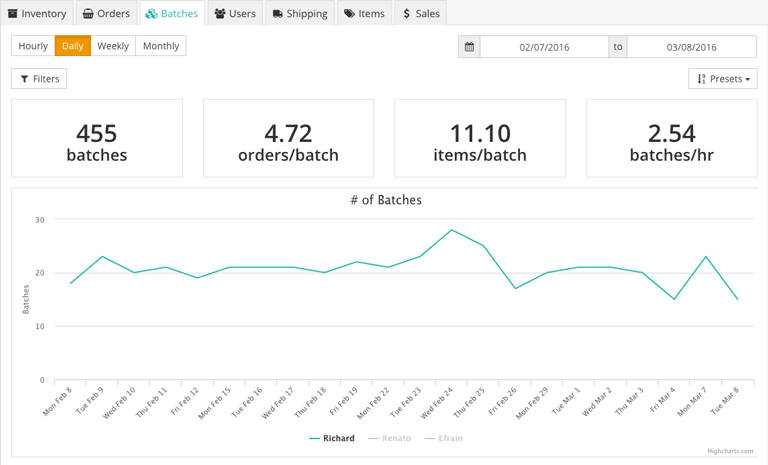 The Batches tab will outline some at-a-glance batch fulfillment metrics for a given time range, such as the average orders and items per batch. Batches: The total number of batches fulfilled within the selected date range. Orders/Batch: The average number of orders per batch among batches fulfilled within the selected date range. Items/Batch: The average number of items per batch among batches fulfilled within the selected date range. Batches/Hr: The average number of batches per hour among batches fulfilled within the selected date range. Pick Time: The total amount of time spent picking order items within the selected date range. Ship Time: The total amount of time spent configuring shipments within the selected date range. Pack Time: The total amount of time spent packing processed orders within the selected date range.